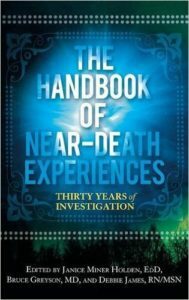 This is a careful overview of published studies about NDEs. The book is built around presentations from the first two days of the 2006 IANDS conference. That event at The University of Texas M. D. Anderson Cancer Center in Houston brought together NDE researchers from around the world to discuss the major findings of three decades of exploration into NDEs. Follow this link to buy the book.